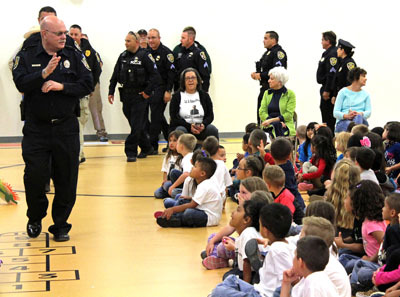 Above, Artesia Police Chief Don Raley addresses the students of Grand Heights Early Childhood Center Wednesday afternoon, thanking them for their donations of water and Gatorade to the APD, Artesia Fire Department, Eddy County Sheriff’s Office, and other area first responders. A total of 1,415 cases were donated as part of the drive, held each year in honor of Cpl. D. Robert Harvey. 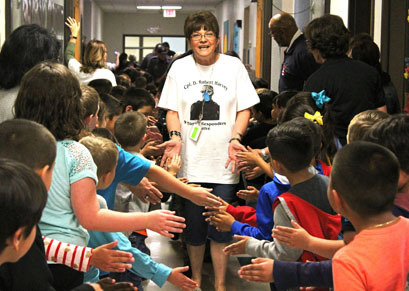 At right, Harvey’s mother, Diana, a Grand Heights teacher, makes her way through the “high-five tunnel,” through which students thanked all attending first responders for their service.